Welcome to my turn on the Where Flowers Bloom Blog Hop, hosted by Carla at Creatin' In the Sticks. 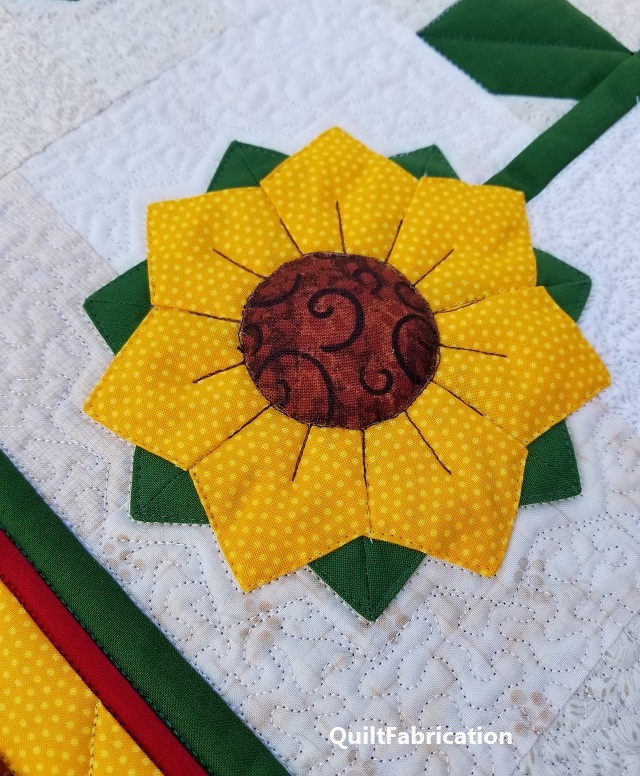 I've shown a couple sneak peeks, and now it's time for the full reveal of Sunflowers! Aren't those Dresden plate sunflowers just adorable? Especially with their puffed centers - the ladybugs certainly can't resist them!! This has turned out so well, I'll be writing a pattern for it, with the release sometime next week. Everybody needs some bright sunflowers to chase away the dog days of summer! In case your just finding this fun hop, here's the list of all the other participants, and there's a lot! Have a great time viewing all the other flower projects, and I'll keep you posted on the pattern for this one. I love how the bit of puff here and there,if I could spell it I would call it by the proper name. The love the overall pattern. It is one you do not have to use on a table but hang it on a narrow wall space..I am looking forward to the pattern! Well worth the wait. Thanks Robin! It is a perfect size for a dining table, coffee table, or the wall! It's beautifully done, Susan! 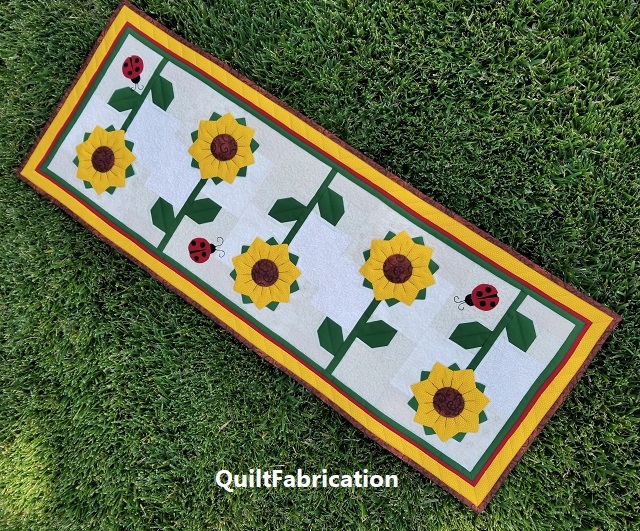 I think sunflowers are a favorite of many gardener and quilter alike. Thanks Julie! Sunflowers just sing summer - how can that not be anyone's favorite? Sunflowers are my favorite floral motif to use, and yours are gorgeous! The table runner is really wonderful! Your table runner is lovely! I really love the dresden sunflowers and the cute little lady bugs! Thanks for sharing! I love this! It would brighten up any table. I also like the idea of hanging it on a wall as suggested by an earlier comment. Sunflowers (and coneflowers) are my favorite flowers! I love your runner and I also love the Dresden plate too! The addition of the ladybugs really make this runner. Nicely done! Love Love Love the Sunflowers Susan... that little ladybug is also absolutely adorable on your runner. The puffed effect is a perfect addon to the whole project. I just love it. Thanks Marian! 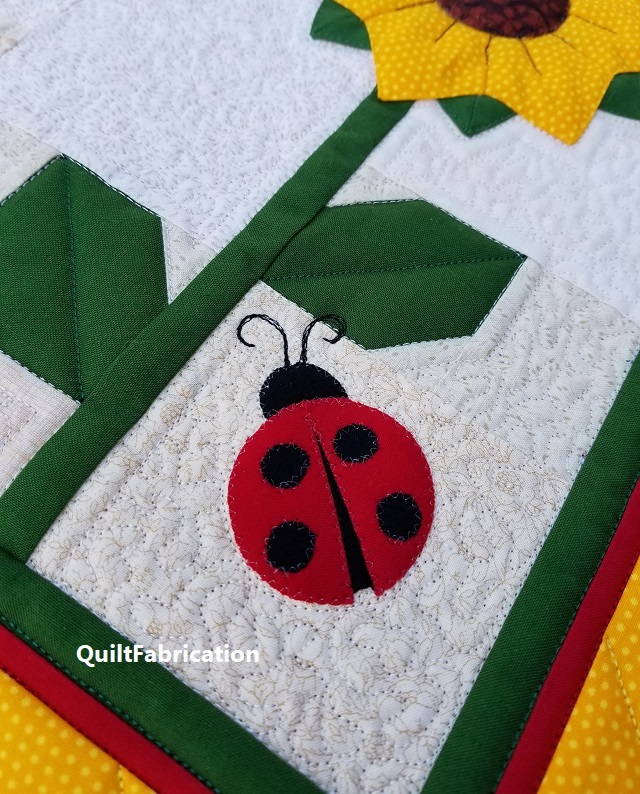 I love those ladybugs too - their the perfect addition! I like everything about this lovely runner,your quilting is perfect as well. I have seen so much great work in this hop. Thank you! Good to hear you're enjoying the hop - hope it's giving you lots of creative ideas! Love the sunflowers, puffy centers and all, but the lady bugs are the topper. Great job. Oh my gosh, Susan, that is just the cutest runner...love the Dresdens! Thanks Carol! I just love it when a project just turns out really well - this is definitely one of those! Awesome sunflowers and irresistible lady bugs. Great table runner! Your sunflowers would brighten up any room. The ladybugs are so cute. Thank you! This runner is already brightening up my living room! Oh my goodness...that is just too cute. Perfect for anyone's summer day! Looking forward to the pattern release! Oh, Susan, this so adorable. Thank you for joining the Where Flowers Bloom Blog Hop. This is just perfect for the hop. Thanks Carla! And thank you for the hop idea - definitely a good one! I love sunflowers! And the ladybugs are so cute! I will have to add this cutesy to my "to sew" list. Thank you so much for the quilt love! Very cute, Susan. Another for my list. Thank you - can't wait to see yours! It's wonderfully creative, and summery bright! Thanks for sharing it. Thank you - definitely perfect for summer! Love those sunflowers and ladybugs. I am not surprised that you made something cheery, bright, and fun as we approach summer. Soo beautiful! I love sunflowers! I also love sunflowers. These are so pretty. Very, very, cute. I do love the puffiness. Great flowery project. This is just the bee's knees! I am going to watch for the pattern release. Thanks for the quilt love!